Sneezing, increased secretion and changes in mucosal blood flow are mediated both by efferent nerve fibres and by released mediators (see p.671). Mucus production results largely from parasympathetic stimulation, whilst blood vessels are under both sympathetic and parasympathetic control. Sympathetic fibres maintain tonic contraction of blood vessels, keeping the sinusoids of the nose partially constricted with good nasal patency. Stimulation of the parasympathetic system dilates these blood vessels. 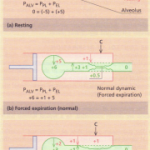 This stimulation varies spontaneously in a cyclical fashion so that air intake alternates slowly over several hours from one nostril to the other. The erectile cavernous nasal sinusoids can be influenced by emotion, which, in turn, can affect nasal patency. Allergic rhinitis develops as a result of interaction between the inhaled allergen and adjacent molecules of IgE antibody present on the surface of mast cells found in nasal secretions and within the nasal epithelium. Release of preformed mediators, in particular histamine, causes an increase in permeability of the epithelium, allowing allergen to reach IgE-primed mast cells in the lamina propria. Sneezing results from stimulation of afferent nerve endings and begins within minutes of the allergen entering the nose. This is followed by nasal secretion and eventually nasal blockage at a maximum of 15-20 min after contact with the allergen. Although the mast cell contains or can generate many other potent vasomotor and chemotactic factors , the exact role for each of these has still to be evaluated. It is likely that histamine plays a more important role in the development of allergic rhinitis than of asthma, since antihistamines are a useful and effective treatment for allergic rhinitis but are of little value in the everyday management of asthma. More mast cells are present in the nasal mucosa of individuals with rhinitis compared with those without rhinitis, and increase as allergen stimulation continues, accounting for the increasing responsiveness of the nose to lower amounts of grass pollen as the season progresses. The mechanisms for recruitment of mast cells under these circumstances probably involves the release of interleukin-3 from T lymphocytes. A DETAILED HISTORY is mandatory for the diagnosis of allergic factors in rhinitis. 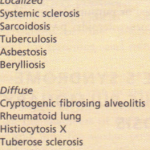 SKI -PRICK TESTI G indicates that the mechanisms leading to allergic rhinitis (or asthma) are present in human skin. 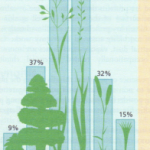 It does not necessarily mean that the particular allergen producing the weal causes the respiratory disease. However, if there is a positive clinical history for that allergen, a causative role is Likely. SPECIFIC SERUM IGE ANTIBODY against the particular allergen provides the same information as the skinprick test. Removal of a household pet or total enclosure of industrial processes releasing sensitizing agents can lead to cure of rhinitis and, indeed, asthma. Pollen avoidance is impossible. Contact may be diminished by wearing sunglasses, driving with the car windows shut, avoiding walks in the countryside (particularly in the late afternoon when the number of pollen grains is highest at ground level), and keeping the bedroom window shut at night. These measures are rarely sufficient in themselves to control symptoms. Exposure to pollen is generally lower at the seaside, where sea breezes keep pollen grains inland. The house-dust mite infests most areas of the house, but particularly the bedroom. Mite counts are extremely low in hospitals where carpets are absent, floors are cleaned frequently and mattresses and pillows are covered in plastic sheeting that can be wiped down. Such conditions need to be reproduced in the home if mite counts are to be reduced to levels that can diminish symptoms. Avoidance is best achieved by enclosing bedding in fabric specifically designed to prevent the passage of mite allergen though allowing water vapour through. This is both comfortable and reduces symptoms. Acaricides are less effective. Antihistamines remain the commonest therapy for rhinitis, and many can be purchased directly over the counter in the UK. They are particularly effective against sneezing, but are less effective against rhinorrhoea and have little influence on nasal blockage. The first generation sedative antihistamines should not be used. Second generation drugs such as astemizole (10 mg daily), cetirizine (10 mg once daily) and terfenadine (60 mg twice daily) are highly specific for HI receptors; they do not cross the blood-brain barrier and are therefore not associated with sedation. The recommended dose of terfenadine and astemizole must not be exceeded nor must they be prescribed with erythromycin or ketoconazole (which reduce their hepatic metabolism) since fatal cardiac arrhythmias may occur. Although rarely sufficient for the treatment of rhinitis, antihistamines will control itching in the eyes and palate. does not develop. Secondary nasal hyperaemia can occur some hours later as a rebound effect and rhinitis medicamentosa can develop if patients subsequently take increasing quantities of the local decongestant to overcome this phenomenon. Local decongestants may be the only effective treatment for vasomotor rhinitis, but patients must be warned about rebound nasal obstruction and must use the drug carefully. Usually, such preparations should only be prescribed for a limited period to open the nasal airways for administration of other therapy, particularly topical corticosteroids. These drugs, previously considered to act primarily by preventing release of mediators from mast cells and called therefore anti-allergic compounds, are now known to influence a number of aspects of inflammation including mast cell and eosinophil activation and nerve function, and are best labelled anti-inflammatory drugs. Sodium cromoglycate applied topically in spray or powder form is of limited value in the treatment of allergic rhinitis, though is very effective in the management of allergic conjunctivitis. The most effective treatment for rhinitis is the use of small doses of topically administered corticosteroid preparations (e.g. beclomethasone spray twice daily or fluticasone propionate spray once daily). The amount used is insufficient to cause systemic effects and the effect is primarily anti-inflammatory. Preparations should be started prior to the beginning of seasonal symptoms. The combination of a topical corticosteroid with a nonsedative antihistamine taken regularly is particularly effective. Seasonal and perennial rhinitis respond readily to a short course (2 weeks) of treatment with oral prednisolone 5-10 mg daily if other therapy has failed. Nasal polyps respond well to such oral doses of corticosteroids and their recurrence may be prevented by continuous application of topical corticosteroids. Only about one-third of sore throats are due to infection with a haemolytic streptococcus and this proportion appears to be falling. The commonest viruses causing pharyngitis are those of the adenovirus group, which consists of about 32 serotypes. Endemic adenovirus infection causes the common sore throat, in which the oropharynx and soft palate are reddened and the tonsils are inflamed and swollen. Within 1 or 2 days the tonsillar lymph nodes enlarge. Occasionally, localized epidemics occur, particularly in schools in the summer-time, with episodes of fever, conjunctivitis, pharyngitis and lymphadenitis of the neck glands; these are due to adenovirus serotype 8. These diseases are self-limiting, and symptomatic treatment is all that is required. More persistent and severe tonsillitis requires antibiotic therapy. The bacteria causing this are now predominantly H. influenzae and Staphylococcus aureus many producing J3-lactamase and therefore resistant to penicillin! arnoxycillin. Treatment should be with co-amoxiclav 250 mg three times daily or cefaclor 250 mg three times daily. Acute laryngitis is an occasional but striking complication of upper respiratory tract infections, particularly those caused by viruses of the parainfluenza group and the measles virus. Inflammatory oedema extends to the vocal cords and the epiglottis, causing considerable narrowing of the airway; in addition, there may be associated tracheitis or tracheobronchitis. Children under the age of 3 years are most severely affected. The voice becomes hoarse, the cough assumes a barking quality (croup) and there is audible laryngeal stridor. 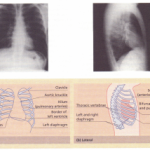 Progressive airways obstruction may occur, with recession of the soft tissue of the neck and abdomen during inspiration, and in severe cases central cyanosis may occur. 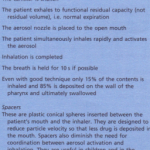 Inhalation of steam may be helpful; in severe cases endotracheal intubation may be necessary. Oxygen and adequate fluids should be given. Rarely, a tracheostomy may be required.